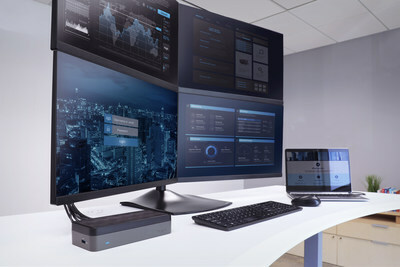 ANAHEIM, Calif., Nov. 8, 2018 /PRNewswire/ — Targus, the industry leader that introduced the first universal dual-video docking station, announced today that its USB-C™ Universal Quad Video HD Docking Station (DOCK520USZ) has been selected as a CES 2019 Innovation Awards Honoree in the Computer Peripherals category. Revealed today at CES Unveiled in NY, this award-winning dock will be displayed at the CES Innovation Awards Showcase during CES 2019 in Las Vegas. Targus will also be showcasing its honored Universal Quad Video HD Docking Station along with other next generation docking solutions and accessories throughout the show starting with CES Unveiled on Sunday, January 6 and continuing at its booth (LVCC, South Hall, Booth #31147).